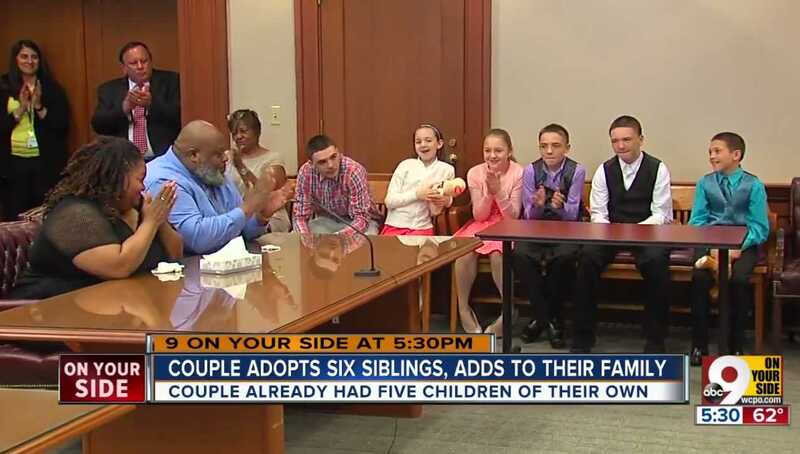 CINCINNATI, Ohio — An Ohio couple with five children has adopted six siblings in foster care who wanted to stay together as a family. Christopher and Christina Sanders of Forest Park had made an agreement prior to becoming foster parents that they would keep the children, and would always keep siblings together, no matter how many. In 2014, the Carsons took in six children whose parents had been addicted to drugs: Coby, 16, Christan, 14, Caleb, 13, Cayley, 12, Carson, 10, and Chloe, 9. The couple already had five biological children, and their names also all began with the letter C: Christopher, Cameron, Caden, Chaz and Caitlyn. On Thursday, surrounded by family members, friends from church, social service workers and the children’s school teachers, the Sanders made the six an official part of their family in Hamilton County Adoption Court. “I love those children as if they were my bios,” Christopher Sanders told local television station WLWT. He also credited his wife as having a big heart, and said that her love had rubbed off on him. The children say that they are thankful for the Sanders and state that their lives have changed for the better. “I would not know where I’d be right now if it wasn’t for the Sanders. We [were] having a rough life before,” Caleb told the court. Coby said that he was shy and introverted before coming to the Sanders’ home. Probate Judge Ralph Winkler praised the Sanders for their care for the children. “They serve as an example … to how people can change the community one child at a time—or six children at a time,” he stated. As previously reported, adopting children in foster care is very inexpensive compared to a private or overseas adoption.